Easter belongs to the most popular holidays in a large part of the world. It celebrates spring with the awakening of nature, its fertility, hope and love. 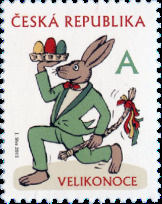 Different villages boast different Easter customs and traditions that used to spread over the entire six-week Easter period. The aim was to get rid of everything old, to clean the house and cure the body to make them ready for the rebirth of nature. Easter is a moveable feast that falls on a different date every year - always on the first Sunday after the first Spring Full Moon. If the first Spring Full Moon falls on a Sunday, Easter is celebrated the next Sunday. This means that Easter Monday may fall on any day between 23 March and 26 April. A stamp identified with the letter A corresponding to the price of Ordinary Letter – Standard up to 50 g in domestic service (current price according to the Price List of Basic Postal Services).